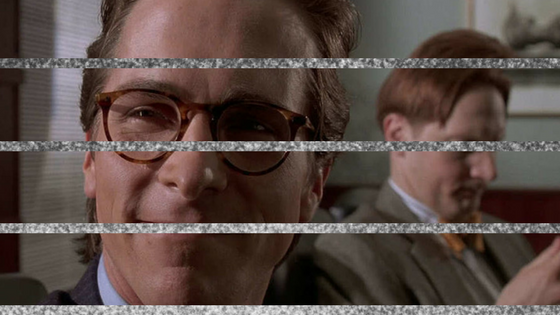 In this third part of my “What Patrick Bateman Actually a Psycho” series, we will be exploring depersonalization, derealisation, schizophrenia, and anxiety and depression disorders. It is important to explore these disorders and theories to unpack the complexities of Patrick Bateman’s life and motives for the atrocities he had committed. Schizophrenia is where we will begin: many readers and critics alike have pondered if Patrick was not a psychopath but if he instead was living with schizophrenia. Creating a world for himself that was grandiose to an incredible extent and a bloodlust that was taken right out of a horror movie. Schizophrenia, according to the DSM-IV TR, is a disorder that lasts for at least 6 months and has two or more of the following symptoms: delusions, hallucinations (auditory and/or visual), disorganized speech, grossly disorganized or catatonic behaviour. Generally speaking, it is a cognitive and emotional disturbance that can disrupt perception and impede normal daily functions. Symptoms may also include a grandiose sense of self. There has been evidence in the novel pointing out that Patrick did and did not commit the crimes. If he did not commit the crimes, many of us are lead to believe that he may be suffering from schizophrenia or another psychotic disorder, but if he is committing the crimes then he must be a psychopath. Regardless of the latter statement, the evidence that Patrick might be hallucinating and losing himself in this hallucination has been blatantly hinted at several times. Ending a chapter in the middle of a sentence, talking nonsense, referring himself in the third person nearing the end of the book (pages 349 to 373), his internal and external dialogue interrupting each other (this one is probably something we all do but it happens more frequently to Patrick and could be regarded as disorganized thinking, or what many would refer to as ‘ramblings of a madman’). Because the book is written in a first-person narrative with an unreliable narrator, we the readers have no concrete evidence to explain what may or may not be happening. We only know what Patrick is telling us, we only know of his world, but as the novel moves forward we get clues that Patrick is coming undone. There is something wrong – perhaps pathological— with him and his sense of reality. Those who suffer from schizophrenia often talk about their sense of reality. It is vastly different than other people who do not suffer from the disorder. Most of the time, hallucinations either auditory or visual plague them in their daily life, making it difficult to conform to the normal societal standards (i.e., maintaining a fulltime job, participating in social functions, keeping relationships steady). Because of delusions and hallucinations, their narrative of their world is completely different than what we may imagine. If schizophrenia is generally defined as cognitive and emotional disturbances then we can generally conclude that this what Patrick is suffering from. But before we make such a leap, we must look at the other issues that could be plaguing Patrick. Issues that I always thought Patrick might be suffering from is depersonalization and/or derealization. Depersonalization is a part of the dissociative disorders, and is a severe and disruptive feeling of self-estrangement or unreality; however, it does not include any disruptions in memory like other dissociative disorders. This disorder is normally triggered by stress, and people suddenly lose their sense of self and unusual sensory experiences. For example, their limbs may seem distorted as if they have changed by getting smaller or bigger, or their voice sounds strange to them. Sometimes they believe that they are outside of their bodies viewing themselves from a distance. If they were to look into a mirror, they would not recognize their own reflection; their body and mind are separate – dissociated—from each other. A depersonalization episode can sometimes occur in different disorders such as schizophrenia. Patrick had these moments where it seemed like he did not know who he was or what he was doing, sometimes referring to himself in third-person. As if he left his body and was viewing himself from a distance and narrating what he was witnessing. Derealization is categorized as an anxiety disorder in which the person feels that the world is not real as well as fears of losing control, of going crazy, or even dying. As with depersonalization, it is the belief that the world around them is not real. Depersonalization is categorized as dissociative and derealization is categorized as an anxiety or fear. Although Patrick has a fear of losing control, he does not seem to suffer from derealization. Patrick does, however, have many anxieties and fears, such as not fitting in, not purchasing designer goods that would make him appear wealthy but also desirable, not being seen with people in public, not losing his cool, casual exterior. Anxiety does plague Patrick’s life in many ways as I have mentioned. I think it is important to remember that even if Patrick is suffering from Antisocial PD or Schizophrenia that it is not uncommon to also suffer from anxiety. His need to have everything in control and that need can turn into stress, and therefore his need to kill. Patrick does not always commit murder because he is stressed, anxious or frustrated, sometimes he admittedly does it for fun. He has no regard for people, which is what makes him a monster even if he did not actually kill everyone he confessed he killed. So what about depression? Depression is often comorbid with several other disorders; thus, I thought it appropriate to briefly talk about it here. Depression is categorized by the intense feelings of worthlessness, indecisiveness, guilt, sadness, and apprehension. Usually sufferers also experience lack of appetite, loss of sleep and interest. Since many of us will deal with depression sometime in our lives due to how common it is, I, however, do not believe that this is what Patrick dealt with. Patrick in many ways is inhuman no matter how desperately he tries to convince us and his friends that he is incredibly in touch with humanity and no one else is as in touch with it as he is. No one. Patrick engages in all the pleasure-inducing activities as wants, and he has no feeling of guilt or profound sadness. He is glib and feels almost nothing. What does that make him? Have you decided what Patrick is? The next and final part of the series is a showdown between schizophrenia and Antisocial PD. I will be breaking down arguments for each disorder and potential comorbidities and possible treatments.